This entry was posted in birds, hummingbirds and tagged birds, hummingbird, hummingbirds, wildlife by Sheri. Bookmark the permalink. All very well stated, Sheri! I found a pre-fledgling and could not locate its nest. I placed it in an old shoebox with cloth and toilet paper and fed it sugar water until his mom found him after she heard him crying. All day, she has been feeding him on our balcony every 20-30 minutes (we’ve been clocking) and now that it is dark, she’s not returning (probably sleeping). The baby has also gone to sleep now that it is dark, but it is going to be a rather cold night… 50 degrees Fahrenheit (10ish Celsius). Should I bring the box inside for the night, providing I keep the baby in the dark so that it doesn’t think it’s day? (My parents are pushing me to “save the baby from the cold,” but I’m not sure if a night in a warm, cozy house will spoil it.) Please reply quickly, what do I do? Bringing the youngster inside is okay as long as there are no pets or young children who might pose a threat to it, but if it is well feathered it should be okay outdoors as long as it’s in a location that’s safe from predators and sheltered from too much heat radiation (under a leafy branch, for example). The bird should have only a few more days of life in the nest, so taking it into captivity seems like a bad idea, but a wildlife rehabilitator who specializes in hummingbirds can give you additional advice on how to recreate the lost nest so that the female can resume parenting without need for further intervention. Thanks! The bird has been doing splendidly! However, it is going to rain tonight, and the water might damage the shoebox “nest” and I don’t know if the rain would impede his mom from coming to feed him. We’ve put a roof over him and are hoping he’ll be all right, but we do have to leave for a trip tomorrow, and won’t be back until sunday, so in case something goes wrong, we won’t be here. We’ve tried that “no need for intervention” thing, but once the baby bird fell into a cranny in the box and was stuck, and the mom didn’t see him and left. We had to scoop him out and wait another half an hour for the mom to return and feed him, and boy was he hungry. We’re afraid something will go wrong while we’re gone… while we do want him to grow up to be strong and independent, our aversion to letting him starve is somewhat stronger. Should we just leave him be and observe nature take its course? You need to move the baby to a much smaller box with better filling (natural cotton batting would be good) to keep that from happening, and make sure it’s protected from the weather as much as possible. At this stage it would be better to let the youngster and its mother deal with the weather while you’re gone than turn it over to a wildlife rehabilitator. Betty, if the nestlings really are 7 days old (with pinfeathers only) and you haven’t seen the mother at all for several hours, call a wildlife rehab organization immediately for assistance. If the young have “real” feathers and are not peeping to be fed, they are probably just fine. Intervening unnecessarily could sentence these nestlings to death, so do not attempt to “rescue” them without using the guidelines in the post to be absolutely certain that they need help. Southern California is a very large area with a large number of wildlife rescue organizations. The organization named and linked in the post, Project Wildlife, is in San Diego. If you do not live in or near San Diego, the staff at Project Wildlife may still be able to help you with a referral to a wildlife rescue organization nearer to you. Otherwise, call your nearest nature center, zoo, or office of California Fish & Game for a referral. My 6 & 8 yr old grandsons ‘rescued’ a baby hummer 2 yrs ago that had gotten covered in motor oil. Their uncle uses motor oil to cover the pole the feeder is suspended from to deter squirrels/ants from the feeder. Arguments over this practice has not resulted in his quitting. Anyway . . . I ended up caring for the little hummer after the boys tired of hourly feedings for 2 days and calls to the Wildlife & Fisheries agencies only resulted in ‘Let the bird go and fend for itself!’ – which it clearly could not do. While I DO NOT ENCOURAGE THE KEEPING OF HUMMERS OR ANY OTHER WILDLIFE, I do encourage ‘rescue’ if, indeed, they need rescuing. I found the W&F response to be lazy and cold – to let this gorgeous creature of God die without even trying to help just did not seem right to me. Donna: Though this situation falls outside the scope of this post (which is about “orphaned” nestlings only), I appreciate your dedication and congratulate you on your success. However, I’ve edited out the details in order to avoid encouraging others to follow your example. The response from your state wildlife agency was totally inappropriate; they should have referred you to a licensed wildlife rehabilitator or wildlife rescue organization, preferably one with hummingbird experience. With a little more searching, you would likely have found one on your own. Though I doubt most “rehabbers” could have done much better by the little guy than you did, a legitimate rehabber has met the legal requirements to keep and care for native birds and has resources for specialized care that aren’t available to the average bird lover. It is always better to put such problems into the hands of a licensed, experienced person than to DIY and risk a tragic outcome (particularly where tender-hearted children are involved). Hi Shari. 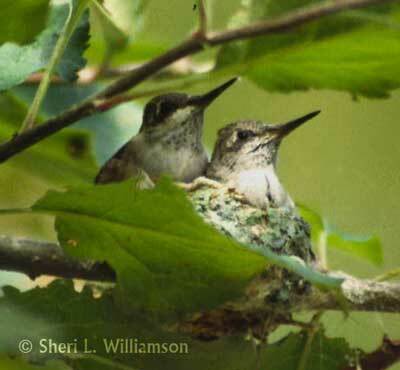 This afternoon, I disturbed a hummingbird nest and the two babies flew a short distance out of the nest. One landed in the street, but without touching it, we managed to coax it back into the tree (but not its nest). The other disappeared but later we saw it sitting on a branch fairly close to the nest also. They are still sitting on the branch and look to be sleeping now. Since they can fly short distances, should I just let them be or should I try to get them back in the nest? I’m afraid if I try to get them back in, they’ll be startled and fly off again. Hi, Snuf. Sounds like they would have left the nest very soon anyway. Once they do, they break their silence and start peeping so that their mother can find and feed them. As long as these two are sheltered and relatively safe from predators, you can leave everything up to their mother. I wish I had read this information earlier. There is a humming bird nest up on the light fixture outside our front door. 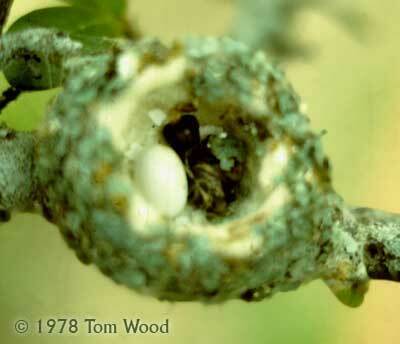 It was there last year and mother raised two healty baby hummingbirds there. She came back this year and had two more. We have been very careful to not go in and out of the front door because we didn’t want to disturb the nest. Two days ago I went to check on the babies and they had their heads up and were “peeping”. I left so the mother could come. Yesterday I noticed their heads were up, resting on the side of the nest. This morning their little heads had not moved from where they were yesterday and I checked them and they have died. I just feel sick that I didn’t help them. I wish I had know that their “peeping” meant they were in distress. My husband and I will be removing the little babies but we plan on leaving the nest there. Hopefully the mother is fine and she will return next year. Don’t blame yourself, Carol. 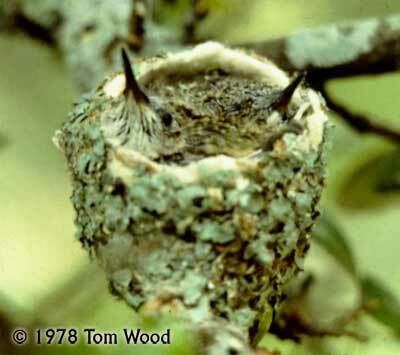 Popular culture has taught us that healthy nestlings peep, so it takes special knowledge of hummingbirds to know that it’s a sign of trouble. Hummingbird mothers don’t just abandon their young, so I doubt that she’ll be back. That doesn’t mean that another female won’t nest in that same location, though. One thing you can do to encourage future nesting is to give them something to build with. Wild bird retailers sell dispensers of nesting material, but you can make your own by stuffing a clean suet cage with soft natural fibers such as cotton, wool, and pet hair. Hummingbirds prefer white material to match their eggs, but other birds may use other colors (my local Cactus Wrens like the gray hair from my dog and cat). Make sure the fibers are short to reduce the chance of injuries, and only use pet hair that’s free of flea/tick shampoos, dips, and other topical pesticide treatments. Thank you Sheri for the information on nesting material. I think I will be putting up something this weekend, along with a new humming bird feeder! I just wanted to update you on the nest. There is a hummingbird that is using the nest again! She is sitting in it but I don’t know if the eggs have hatched. Because the nest is in the light fixture above the front door, we are using the side door to come in and out of the house. We are expecting the temperature to be over 100 degrees this weekend and I’m wondering if I should put a fan on low in the front entry just to keep the air circulating? Good old Darwinian natural selection has adapted hummingbirds that live in hot climates to survive high temperatures. Avoiding disturbance is the most important thing you can do to improve this nest’s chance of success, but using a water:sugar ratio of 4:1 or 5:1 in your feeder (weaker in hotter weather) will give the female and her future nestlings the water they need to keep cool by evaporation (panting). “Safe to touch” depends on how gentle you are and what’s on your hands. If your hands are clean and you pick it up with almost no pressure from your fingertips, as though it was the most fragile egg, it should be fine. It’s best to handle nestlings as little as possible once you’ve gotten them into a safe container for transport to a wildlife rehabilitator or rescue center. Sugar water is emergency food only – it can cause stunted growth, damaged feathers, and/or starvation if fed for more than a day or two. Okay, so you shouldn’t feed sugar water for more then 24/72 hours, what do you do after that? Just had a momma hummer disappear from tending her two fledglings – about 13 days old – eyes still closed but with full pin feathers. Have been feeding the normal sugar water for almost 12 hours during daylight hours…hourly, if they’re peeping…making sure their crops are full. What do you feed them next? Contact a licensed wildlife rehabilitator or wildlife rescue organization. Expert care is the nestlings’ only hope for survival. I am so glad I found this website, like everyone out there I thought peeping= good health, and viceversa, etc. The reason I stumbled here is because a hummingbird made a nest in a plant that is not too tall and laid two eggs in the entrance of my house. Now I have two cats, and I was really worried that when the eggs hatched, they would attack the nest because of the peeping, but since hummingbirds don’t peep, I feel more confident that they will be left alone. The mother hummingbird warms up the nest even with my cats near by and they haven’t attacked her, and she isn’t even scared when I walk near by or anything. My concern now is what happens when the birds will leave the nest, how does that happen?? do they fall to the ground inevitably? if that’s the case, what should I do? My cats have brought me little birds before directly from nests and in spite of my efforts they always die, I really don’t want this to happen to those two hummingbirds, any help would be appreciated. If your browser doesn’t open the file and you don’t have the standalone Adobe Reader, download it here for free. Thank you for your reply, unfortunately I am not in a position to build a “Catio” for my cats, or keep them indoor at all times, since I live in a big house with a family of 5, it’s almost impossible to keep them inside, they always find a way out, but they are spayed and they do prefer to stay indoor. I’ll try to keep an eye on the nest and do the best I can. I also read those articles and I do agree that large communities of feral cats pose a problem to birds and wildlife, however I am 100% against euthanizing a perfectly healthy animal just because it’s feral or has no one to take care of them. Such practice is not only cruel and morally reprehensible, it’s downright sociopathic. There are many great organizations like Tenth Life and ASPCA who do not euthanize and always work to find homes for all their cats, it’s a shame that they are so many organizations who are against euthanizing yet they don’t care the whole nine yards for the animals they rescue, however, unless an animal is in suffering, it will never be ok, or humane or responsible or even acceptable to murder an animal just because it can’t be adopted, animals can always be adopted if we work hard enough to find them a home, euthanasia is the cruel, easy way out for everybody except the poor animal. I love all animals but it’s unfortunate that bird lovers put a negative spin on a feline’s nature, as if they were a pest, or a plague, they are natural born killers, it’s who they are and this campaign against cats because they kill birds has got to stop, it just opens the door for more cat abuse, which are the most abused animals out there. I’m glad that you’ve taken one positive step and neutered your cats, Ramón, but you’ve got a bad case of tunnel vision. Dogs are natural-born killers, too. Would you allow them to roam the streets threatening the lives of your cats, other pets, and people? If not, aren’t you being bigoted against dogs the way you claim bird people are bigoted against cats? What about all the millions of “pests” that are killed for human convenience? Rats are highly intelligent, social creatures. Do you support Trap-Neuter-Release programs as an alternative to poisons and traps? It’s hard to believe that so many people who rant about the inhumanity of euthanizing unwanted cats don’t seem to give a meaningful damn about the more than 2 billion wild animals (including more than 300 million wild birds) that die painfully and needlessly every year in the jaws of free-roaming cats. Pardon my bluntness, but it makes your righteous indignation about cats and your claim to care about wildlife ring more than a little hollow. I’d be much more impressed if you told me how hard you were working to end the double standard on leash and license laws and enact legislation to increase penalties for irresponsible people who contribute pet overpopulation and homelessness. No one but a psychopath wants to kill cats (or dogs), but the tragic reality is that there will never be enough homes for the 50-70 million homeless cats in the U.S. There are only about 115 million U.S. households, many of which either already have as many cats as they can handle, aren’t allowed to keep pets, or are having trouble just feeding themselves and keeping a roof over their heads. Until we find ways to dramatically reduce pet overpopulation, homeless animals will always have to suffer and die, and there are many far worse ways to die than euthanasia. I found a baby hummingbird (but with all it’s feathers and some light warm brownish/ orange coloring) near our parking garage. The garage was freezing (50 degrees outdoors) and the bird was trying to get warm. I took it and placed it in shoebox, then after leaving it alone for one hour, it died. Any ideas? It didn’t look severely injured, it wasn’t peeping. But it was fluffing up its feathers and shutting its eyes. I’m heartbroken. I’m curious as to what may have gone wrong but can’t find anything specific online. How come hummingbirds die within their first year of life? Without a necropsy, it’s impossible to say why it died, but it must have been in very bad shape when you found it. Considering your description and location, it was likely an Allen’s Hummingbird, which are year-round residents in southern California. 50° F. is not very cold at all, and hummingbirds of most northern species can tolerate temperatures at or below freezing (32° F.) for extended periods as long as they have food. A few drops of sugar water might have kept it alive long enough to get it to a wildlife rehabilitator, but that’s far from certain. As hard as it is for us to accept, most wild birds don’t live to beyond their first year. In addition to weather extremes and natural predators, birds in urban environments have to deal with destruction and degradation of habitat, collisions with windows, vehicles, and utility lines, predation by domestic cats, poisoning by pesticides and other pollutants, etc. Untimely tree pruning and other disturbances can destroy eggs and nestlings and separate fledglings from their mothers. To be prepared in case you ever find another hummingbird or other wild animal in need of help, please check the other comments on this post for links to directories of wildlife rehabilitation organizations, find one(s) near your home and/or work, and add the emergency number(s) to your cell phone contacts. This is another case where “LEAVE THEM ALONE” applies. As long as the mother is still caring for them and they’re not in immediate danger, don’t meddle – you could make matters much worse than they are now. I’m loosing sleep! We have been watching our Mama bird care for her babies. From building her nest within our Leyland Cypress trees, caring for her 2 eggs and now she has 2 hatchlings. We have been careful not to disturb her and have only set the ladder up to take pictures twice when she has been away from the nest and fearing that we would be risking drawing attention to the nest. The past few mornings I have heard an increased amount of activity from crows that have been as close as our chimney and I would be heart broken if the crows harmed Mama or her babies. Would the crows eat her or her babies? I would be heart broken. Is there anything I can do to detract them? Human activities can attract the attention of predators and cause nests to fail. If you leave this nest alone and stay as far away from it as possible, the nestlings will have a better chance of survival. I have two baby hummingbirds who are at about the 14-16 day mark after developing their first feathers. I figure they are about 5 days away from flying off. Yesterday I scared them and one flew out of the nest but headed downward then disappeared into a hedge. It hasn’t returned to the nest. Is it possible it can survive hiding under that hedge? Could it have flown off somewhere safer? I feel terrible if it can’t leave the hedge and is starving to death. Premature fledging happens. Once the youngster leaves the nest, its instinct to peep turns on, giving its mother a way to locate it. As long as a predator doesn’t find it, it should be okay. We have a nest that had two babies in it. Mom was around feeding them since they hatched middle of last week. Yesterday, we were gone all day and when we got back, the nest was full of ants. Only one baby was in there dead and we couldn’t find the other one. Do you know why this might have happened? The most likely explanations would be that 1) something happens to the mother and the nestlings died, their scent attracting scavenging ants, or 2) the ants attacked the nest, killing one nestling and forcing the other to leave the nest where it was eaten by a predator or another scavenger. I’m so happy to have found this site! We have a mama bird who built her nest on our windchimes right outside our kitchen window! It’s been so cool to watch this life process. Right after being so excited, I started to worry….what if the baby birds fall out on the concrete and my dog eats them?? So I made a safety net for their imminent fall :) Today I came home and saw a little baby laying on the net a.k.a. my kids blow-up swimming pool. It’s much bigger sibling has grown so big and pushed it out of the nest. I built another nest and hung it from the windchime in hopes that mama bird will continue to care for this baby, too. My concern is that the “nest” that I have built gets more sunlight. Should the baby be completely shaded? And is there anything else that I should know? The substitute nest should be as much in shade as possible. Beyond that, be prepared for the worst. There’s something drastically wrong with a nestling hummingbird that’s much smaller than its sibling, and the mother may choose not to feed it. Cruel as this may seem, putting too much of her resources into caring for a doomed nestling may jeopardize the survival of the healthy one. This is assuming that the birds in question are hummingbirds. If they’re songbirds, the smaller one may be sick or malformed, or it may be perfectly healthy but elbowed out by a cowbird nestling whose mother laid her egg in it’s parents’ nest. In the latter case, the best option would be to get the smaller nestling to a wildlife rescue organization ASAP. 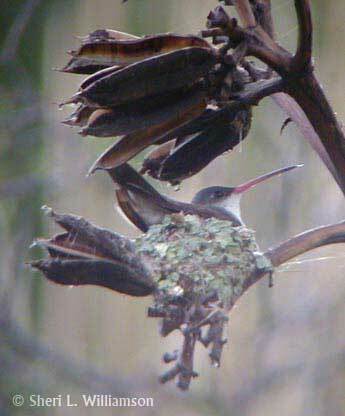 I know you said hummingbirds have adapted to hot climate but I am worried about two little hatchlings on my porch. It is 103F which is a record high this early in the season. The birds hatched last week when it was still in the 80 degree range. They are in shade but they are breathing heavy with their mouths open and necks stretched out. Is there anything I can do that wont upset the mother? There’s a risk of nestling mortality in excessive heat, but the risks of intervention are far greater. The nestlings’ gaping behavior is evaporative cooling, analogous to a dog’s panting. The best thing you can do is make sure they’re getting the extra water they need to stay cool by making your feeder solution a little more dilute, 1 part sugar to 5 parts water. Also, I am so happy I found this blog I love it! It’s not life or death just wondering once its fledgling and left the nest how long will mother bird feed the baby for? That period in a young hummingbird’s life isn’t easy to study, but it’s thought that mothers keep feeding their fledglings for at least a couple of weeks as they learn how to feed themselves.